Please note that this product has been replaced by SILConverters 2.5 and you are strongly encouraged to use that product. This page is retained for those who, for whatever reasons, are unable to use the new version and require an older, unsupported, version. SILConverters 2.2 was recently released in FieldWorks 3.1. It has a major interface change which makes this version incompatible with version 2.0 or earlier (it can coexist with SILConverters 2.1). There are several new enhancements listed below. This package is fully integrated with SIL FieldWorks, providing a single system-wide registry of installed and available encoding converters. 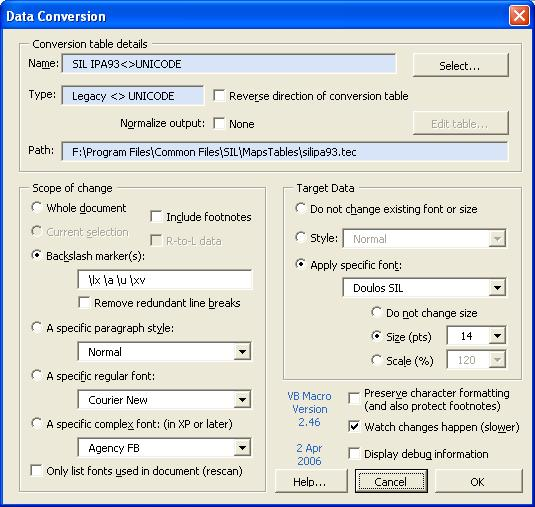 Additionally the package includes some extra utilities such as a clipboard converter for manipulating text between cut and paste operations. AdaptIt (also new in v3.1). This plug-in is included in the basic package (i.e. SILConvertersSetup.exe below), but requires a separate Perl 5.8 distribution to be installed. client applications. This plug-in is also included in the basic package, but it requires a separate Python 2.4 distribution to be installed. allows you to do text processing (primarily match and replace) with Regular Expressions in EncConverter client applications. If the primary converter changes the input string, the word is returned as changed. If the primary converter doesn’t change the string, then the fall-back converter is called. found, then the fallback (algorithmic) process is used. New menus to add, edit and delete converters in the System Repository (using the new Auto Configuration capability—see 5 below). Display Rulecommand: to quickly find Bad Spelling/Good Spelling pairs in the replacement table to modify them. A warning is now displayed if you attempt to add a conflicting rule. word-by-word but only for data in a particular font. Same as above, but using any arbitrary EncConverter; not just a SpellFixer project converter. support to different client applications). Each such configurator has an About help tab explaining the details of the converter type and a Test Area tab for checking the converter with sample data. the round-trip capability of a single (bi-directional) converter. Unicode names for the selected string which can be used to copy/paste into a TECkit map. Python distribution (discussed above) to be installed. Also available is a utility, called SFM Converter, which can be used to convert one or more SFM documents using converters in the system repository. Here’s an image of the new utility being used to convert an SFM document that is encoded with the non-Unicode font Annapurna. This program can also be used to do conversions with Unicode-encoded SFM documents as well by choosing the encoding of the file as you open and save them. The SFM Converter utility requires Microsoft .NET framework 2.0 to be installed. When you run one of the downloaded components, it unpacks itself into a shared installer folder (SILConverters22) and then launches the setup program. The setup program then lets you configure exactly what programs and converters you want to be available on your system. Do not delete the shared installer folder (SILConverters22). You may, now or in the future, want to download additional converter modules, and they use this shared installer folder and setup program as well. You should uninstall EncCnvtrs version 1.5 and/or 2.0 before trying to install SILConverters. Both the 1.5 and 2.0 versions have uninstallers that are listed in Control Panel / Add or Remove Programs. However, several people have encountered problems in uninstalling them (perhaps due to some recent update in the Windows operating system). If your attempts to uninstall the "Encoding Converters" item(s) fail, then see Uninstallation Guide for EncCnvtrs 1.5 and 2.0. SILConverter 2.1 can coexist with SILConverter 2.2 and, in fact, you may run into problems with some of your FieldWorks application if you uninstall version 2.1. Click the download link for the desired add-in and run it (you may either save the file to your computer and then run it or run it directly). This will load the new items into the shared install directory (you didn't delete it did you2?) and automatically launch the installer. 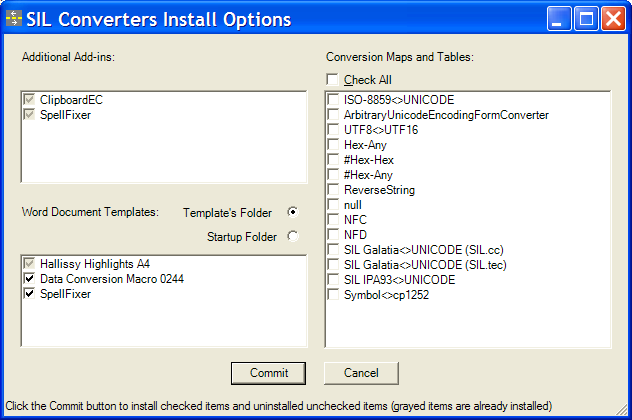 When the Install options window opens, you need to select the additional converters you want to install. You can manually install additional TECkit converters that do not have an installer by following the instructions here. The CC, TECkit, ICU, Perl and Python run-time conversion engines. The core download now also includes the applications and command line utilities from the TECkit package, such as, DropTEC.exe and the TECkit Mapping Editor.exe. These applications can be launched via menu items in the Start / All Programs / SIL Converters folder. The command line utilities from the TECkit package, such as, TxtConv.exe and SFconv.exe, are also installed in the C:Program FilesCommon FilesSIL menu folder. This new plug-in can be used to configure up to 2 EncConverters to be automatically executed on text typed into an edit box – i.e. a helper utility for developing TECkit maps and/or compound converters. This new utility can be used to convert one or more Standard Format Marker (SFM) documents using converters in the system repository. Works for both Unicode and non-Unicode encoded SFM documents. Requires Microsoft .NET framework 2.0 (in addition to the version 1.1 required for the base SILConverters component). This tool is not a full-fledged spelling checking tool. It does not use language-specific dictionaries, and therefore knows nothing about the languages it checks. It is only a consistency checking tool based on phonological similarity, or sets of user-defined ambiguous characters. 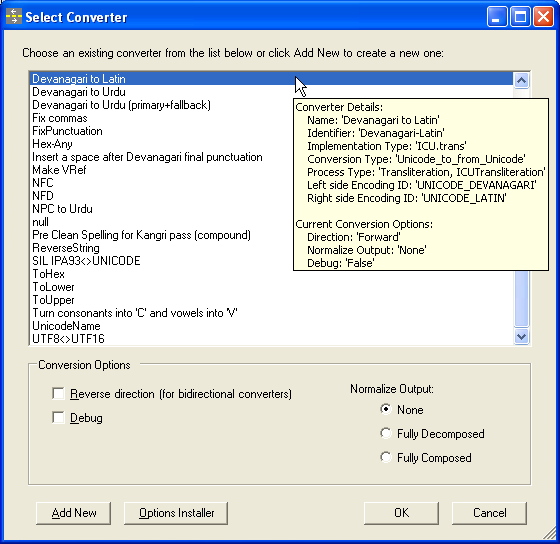 SIL Converters 2.2 program including the basic converters (as it will use the following converters: UTF8<>UTF16 and the Any-Latin). In case the converters are not set up already, the macro will automatically add them for you. If you are using legacy-encoded data (such as WinScript, or Annapurna then you will also need an appropriate Legacy>Unicode converter set up manually. 1 The Correct Whole Document commands do not work on most legacy encoded fonts since Microsoft Word cannot detect word boundaries accurately except with Unicode data. 2 If you did delete the shared install directory that was created during Step 3, simply re-create it by repeating that step. When the installer dialog appears, press Cancel and try Step 4 again.